Do you want a new chest exercise that will really stretch and activate your pecs? This exercise activates all areas of your chest, works on your stabilization skills, and also gives your pecs a nice pull allowing your muscles to lengthen and grow. 1. 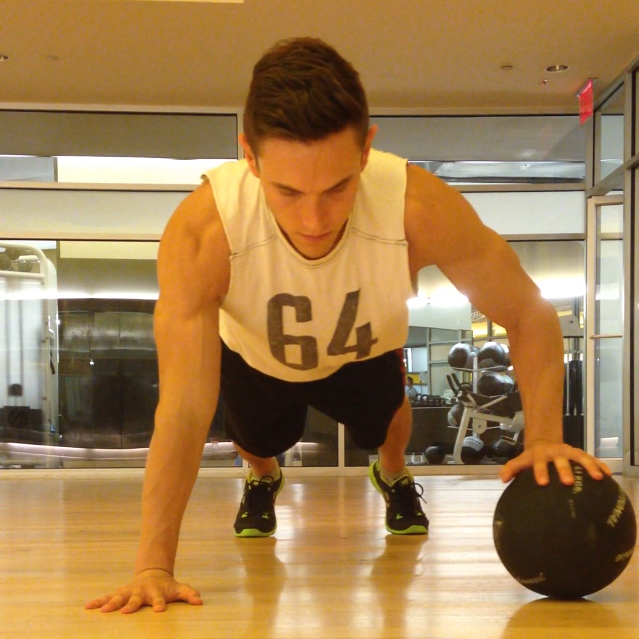 Start in a Pushup Plank Position with one hand on the floor and one hand on top of a medicine ball. 2. 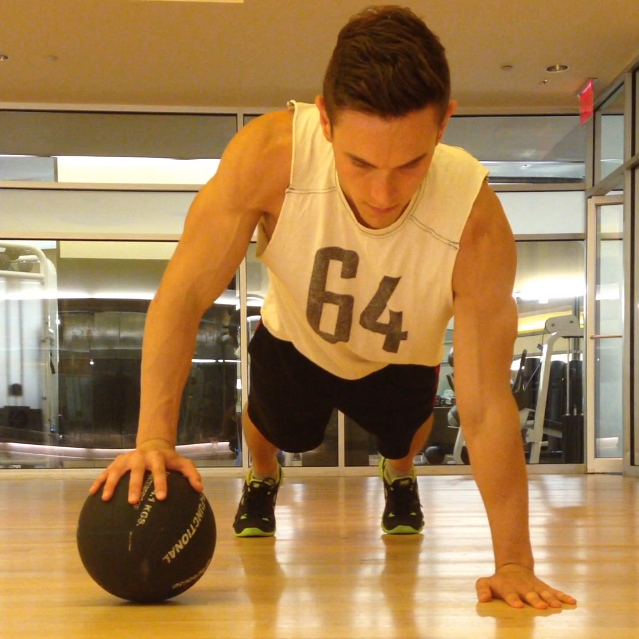 Lower into a pushup keeping one hand on the medicine ball. 3. Return to the Pushup Plank Position. 4. Roll the ball to the opposite hand and repeat the exercise. 5. 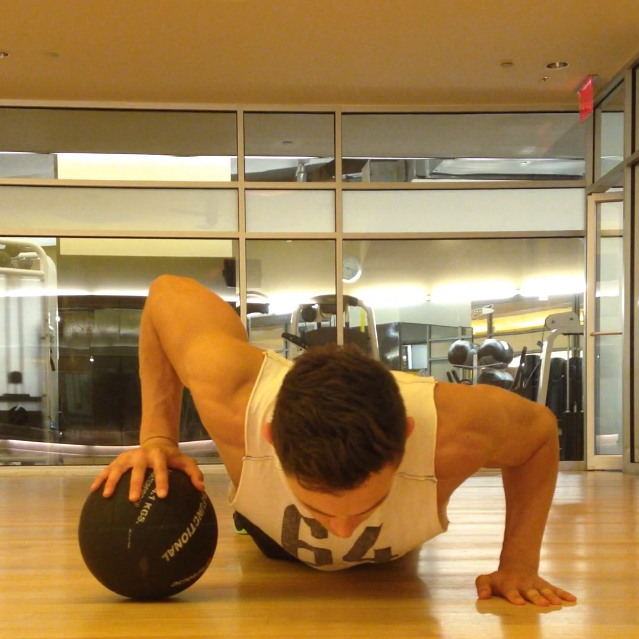 Continue rolling the ball from one hand to the other with a pushup in between. I like to do 10 reps (20 pushups, 10 on the right, 10 on the left). 1. Activate your core in order to stabilize your body. When lowering into the push position, you should not tip to one side or droop your body to the floor. 2. Your chest should be parallel to the floor. If you tilt your shoulders, your chest will no longer be parallel and you will not be using the correct muscles during the exercise. (In the second picture, my shoulders are a little lopsided. Try to avoid this positioning and aim for a more parallel look like the positioning I achieved in the third picture. Form is important for this and every exercise). 3. Your feet can be wide, shoulder width apart, or together. The closer your feet are, the more your core will need to activate to stabilize your body. 4. 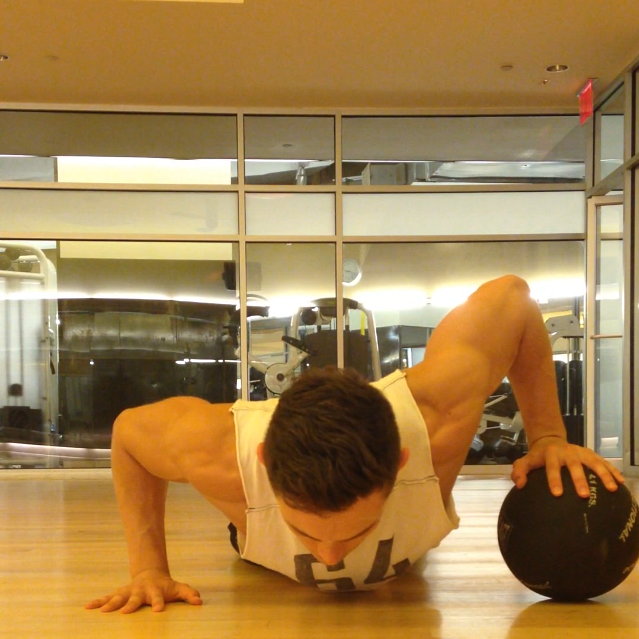 I like to alternate sides during the exercise, rolling the ball to the opposing hand between each pushup. Other people may recommend doing all 10 pushups on one side, and then switching to the other hand to do the other 10. Either way works well, I just find continuously alternating makes the exercise more challenging because you are constantly shifting your weight and positioning. Do you enjoy this workout? Do you have any other chest workouts that may be helpful? Contact me at corestrengthalec@gmail.com with any questions, comments, or ideas for other blog topics.